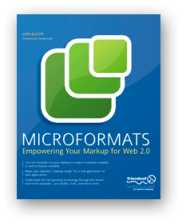 It's been awhile since I've started reading MICROFORMATS empowering your markup for Web 2.0 by John Allsopp, but reading it I found out that it doesn't only explore why, in Bill Gates's words, "We need microformats"; how microformats work; or the kinds of problems microformats help solve. I also learned some neat tips & tricks for CSS like design patterns or other best practices. Westciv have a series of self paced courses available for purchase and download. But you can also follow our courses for free just by returning to this site every week. At the moment we're running CSS Level 1 in the free course program. Every week a new section of the course becomes available, but you have to work around our schedule, as the old sections disappear. Must I add that the Westciv made the Style Master CSS Editor? Since microformats are one of my big interest right now, I found your book a priceless resource, so these words are the least I can do.